The other day I was sitting on the couch reading, when I heard an odd noise. I turned to see what it was and saw Kitten, perched on the back of a chair, hunched over, shaking violently and emitting weird glottal sounds. Out of all of Kitten's oddities (eg. growling when someone knocks at the door, meowing at the sound of the cheese wrapper), this was a new one. For a moment I thought he might be ill. I got up to see if he was okay and realized that he was staring intently out the window. 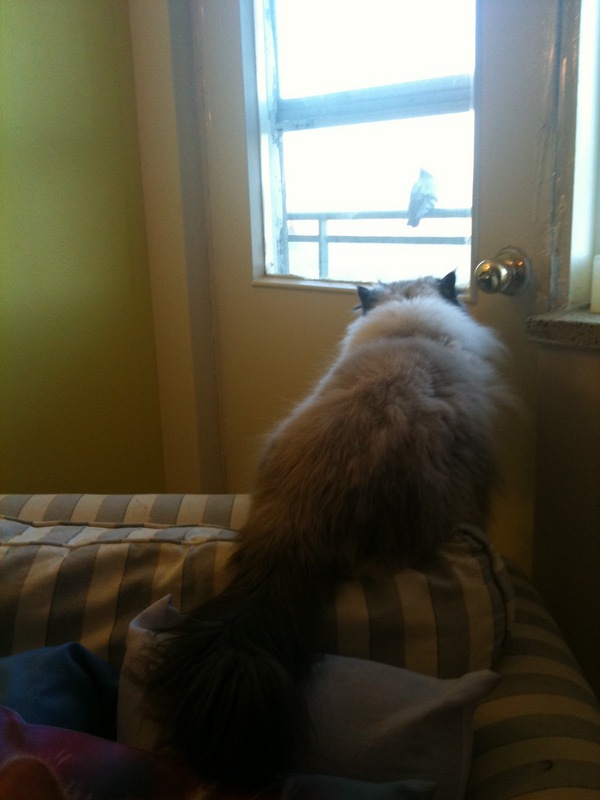 I followed his unwavering gaze onto the rail of our balcony where a single pigeon was perched. Since we live on the 10th floor, we don't often see anything on our balcony. This pigeon however, had made it up and was quite obviously taunting Kitten with her coy head turns and nonchalant stare. I cannot be sure if Kitten wanted to eat the pigeon, play with the pigeon or simply introduce himself to the pigeon. Whatever his intent, his inability to act was causing tremors and involuntary throat sounds. I tried to capture the sounds on video, by my camera couldn't pick them up. I did however take several excellent pictures and video footage of Kitten and the pigeon. In all of these pictures if you look carefully you can see the tape that Boyfriend and I need put around our balcony doorframe to keep Winter out of our apartment.